Added on December 13, 2012 by cynthia zordich. I was raised by a mother who always spoke her mind. Always. Her favorite motto? I say it. You think it. I often wonder-- how awesome it must be to say EVERYTHING that you feel like. I am certain that there is absolutely nothing on my mother's chest. Today is her birthday. 72. In her honor, I decided to let my kids experience the liberating feeling that comes from the unleashing of thought. I handed out trash paper bags, markers and paper and told them all to go off in separate corners. I gave them 15 minutes to write down every negative thought they had in their head-- everything that they can't stand in their lives-- anything they wish they could say to someone, but couldn't. I gave them big thick sharpies for impact. When they were done, I had them wrinkle up each page with passion and rage. Then, I had them stuff and slam those thoughts into their trash bags. From there, we set up a neutral backdrop and photographed each bag accompanied by a very angry child. Some of the kids wanted to throw their thoughts in the air. Some wanted to take them home to destroy them (under supervision). All agreed that it felt good to get it out. To see it on paper and to feel like maybe-- just maybe -- they got rid of a few of them for good. Added on November 4, 2012 by cynthia zordich. With my family scattered all over--I started a tiny mantra for us one day. I had picked up a few great looking rocks at the park- one for each of us. They came in all the shapes and sizes that reflected each one of us. Even though I am suddenly the runt in the fam-- my daughter Aidan's is the smallest rock. She'll always be the baby - no matter how tall. And although both of my boys passed up their old man-- Daddy will always be the 'lead rock'. I keep them out-- one set in my bedroom-- one set on the desk in the den-- a third in the family room. When I walk by, I think about who is having a big day and I'll maneuver the group so that rock sits on top. When Michael is on top-- all of our smaller rocks look so vulnerable-- like any minute we might collapse-- but we never do. We hold him up-- sometimes for days/weeks (I don't always walk by) and when I return, there we all are- a united front, strong because we are together, a distributed balance of support. When Aidan is on top, it looks like she could conquer the world and some day -- I think she might. I always try to get a shot of the assortment for the archives. Looking at them as a group, I can pretty much remember what was happening.The structures have become very intimate treasures of our scattered years. Sometimes, we all huddle together around one rock. I guess that is when one of us is 'on their own' and all we can do is 'be there'. Sometimes, it's up to one person to hold the other one up. That is usually Aidan with one of her bros. Sometimes, as parents-- you gotta stay out. Sometimes, one of them is setting out on a new course and all we can do is line up and either a. follow or b. be there when all hell breaks loose. 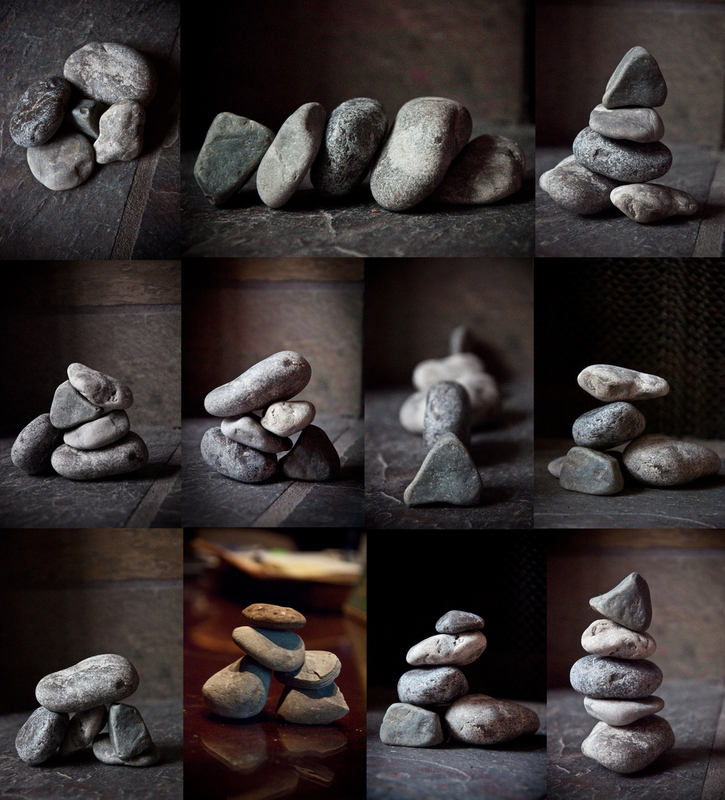 These little rocks-- they speak so clearly of our places in the family. We could learn so much from them and to be honest, there are times that I do-- especially when it comes to pulling my rock away. I always start out in a lead role in the rock pile-- but then I think about it-- think about what's best for them, rather than what makes me feel best. It is then that I restructure and either take on a supporting role or just watch. When I walk away, I feel like I've done something good. As if somehow -- wherever they are, they can feel their placement and importance in the pile up. To date, my favorite is the one where we all lean into each other. To me, it says, 'everyone is okay'. It reminds me of morning cartoons and father's day brunches. Long drives to the Jersey Shore and late nights singing in the den. Those simple memories where there was nothing riding on the day. No wins, No losses, No grades. No goodbyes. We take those days for granted when we are in the middle of them. Those days that build the foundation of the family. At the end of the day, you hope you taught them well about family life and love. You hope that the rocks that make up your little fam serve to anchor as they paddle through the ever changing tides of their lives. LIFE in a cardboard box. Added on July 15, 2012 by cynthia zordich. I always understood nostalgia. I understood the need to take photographs--to preserve, record, to document what was. I saved all of my childhood notes (folded up into footballs). I have all of my high school and college football programs, my bad and some good test grades and some pretty horrible wallet pics of classmates. The photos consume a storage area of my basement named "THE ARCHIVES" by my girlfriends. It is my whole life. It is who I was and why I am now. Old boyfriends still smile up at me through foggy glass. The adhesive may have dried on the albums-- but the discolored memories remain. Last week my daughter Aidan- now 19-- was giggling at all of her instagram shots. There it was. Her rendition of the archives. One big room in one little box--her iphone. That frightened me. The responsibility of her entire history on a phone - a chip-- in the clouds-- I don't know where exactly. What l I do know is, they're not in her hands. This made me nervous and I told her so. What is she going to have to remember all this? All I can imagine is her photos shuffling off into space-- far far away from her. She'll never know what it's like to pour a glass of wine on a rainy day, sit indian-style and go through all of her great "stuff". Interrupting my dark thoughts Aidan yelled out, "Hey, I heard about a site that prints out all of your instagram shots!" Within seconds we made the order. 250 treasures-- heading her way in a click. Within a week her life for the past year was at our front door. I couldn't help but smile as I watched her sit cross-legged on the family room floor with little 4x4's surrounding her. The colors of her life made a fantastic pattern on the carpet. Seeing it all out there in front of her had to be so awesome for her. Look at my life! This is what I do!!! After a few hours and a lot of giggling-- she pulled them all in, packed them up in their cool little boxes and headed up the steps.